While Thomas Merton was in college at Cambridge, he grew interested in psychoanalysis. In particular, this led him to the realization that he was an introvert: “I came to the conclusion that one of my biggest crimes in this world was introversion, and, in my efforts to become an extrovert, I entered upon a course of reflections and constant self-examinations, studying all my responses and analyzing the quality of all my emotions and reactions in such a way that I could not help becoming just what I did not want to be: an introvert” (Seven Storey Mountain, p. 137[Harcourt 1998]). Is introversion really a crime? Sadly, many Christians (at least in Protestant and evangelical circles) have felt the same way Merton did then, but within the Church. In churches where committment is measured by relational connections, being drained by interaction rather than energized is treated as a disorder, even a failure to live into Christian “community”. Rather than fighting our introverted natures to fit into the extroverted mold which evangelical culture privileges, McHugh encourages and empowers introverts to use the gifts God has given them to serve the Church. The chapter on spirituality was also a joy for me to read. It explained why the so-called retreats my college ministry took years ago often felt more like endless dance parties than genuine retreats. Introverts are wired for deep, contemplative forms of spirituality – forms which, while present in other manifestations of the Church, have until recently been ignored in American evangelical circles. While introverts are naturally attracted to the monastic life (where Merton eventually thrived), we don’t all need to become monks to practice contemplative spirituality. The discussions of disciplines like examen, sabbath, and solitude can be practiced by anyone, and give introverts the permission to pursue God in ways that suit our personalities and provide genuine rest and renewal. Best of all, the chapter contains practical advice and helpful questions to guide the reader think through the structure of his or her day, and perhaps even create a “rule of life” that will provide appropriate balance. I can’t say how grateful I am for this book: parts of it resonated deeply with my own story and life in the Church. It’s my prayer that this book will be not only helpful for other introverts wading through the extroverted waters of church-life, but will also make churches evaluate themselves and provide more balanced approaches to ministry. Thanks Adam for this gift to the Church! The word consumption used to apply to disease. It described a wasting away of the body, or was used to describe tuberculosis. Marmeladov, the drunk man whom Raskolnikov encounters early on in Dostoevsky’s Crime and Punishment, speaks of his wife dying from consumption. Two books I’m reading right now think the Church is dying from consumption. The first is Paul Louis Metzger’s Consuming Jesus and the second is Soong-Chan Rah’s The Next Evangelicalism. Both trace the American evangelical church’s division along race and class lines to the consumerization of American society. And there’s much to support that idea: the Church certainly has played mistress and not prophet to the economic structures of the West. As Rah notes, to be a good Christian in America is to be a good consumer. Even immigrant congregations face pressure to assimilate to the unholy (Next Evangelicalism pp. 60-61). He cites two examples that are particularly disturbing. The first is President Bush’s charge to Americans after 9-11: “I encourage you all to go shopping more” (p. 48). I remember hearing these words on television eight years ago. I remember wondering then why it didn’t strike anyone around me as odd (much as I wondered silently why so many of my Christian friends in college eagerly supported the war in Iraq). The best advice this “evangelical” President could give was to shop more? Really? . . . The second example Rah cites is that of a professor at Colorado Christian University who was fired because “his lessons were too radical and undermined the school’s commitment to the free enterprise system.” That quote isn’t from Rah’s own words; it’s the statement given by the university president for why this professor was fired. That president also said “I don’t think there is another system that is more consistent with the teachings of Jesus” than free market capitalism (p. 50). I’m ashamed that this happened at a school that’s inside my home state. Rah continues, “The Western, white captivity of the church means that capitalism can be revered as the system closest to God and the consequent rampant materialism and consumerism of the capitalist system become acceptable vices” (p. 50). The Church doesn’t just fail to confront consumerism, it buys into it hook, line, and sinker: Buy 1 CHRISTIAN CD Get 13 Free CHRISTIAN CDS and God Will Love You More! And yet the system is somewhat inescapable. To cite the books mentioned above, I linked to their Amazon pages. (Though, no, neither was free to me nor was I paid anything to write this.) Still I have to confess I’ve traded the Sound & Spirit subscription for a book fetish, thinking at times like so many other “Ministers of the Word” that the answers to all of my questions can be found in possessing more books. But there are changes we must make to bear authentic witness to Christ’s Kingdom. In Advent, Upper Room will be participating in Advent Conspiracy, encouraging people to spend less and give more meaningful or alternative gifts this Christmas. I look forward to the conversation we’ll have at Upper Room’s Fall Retreat in two weeks about Consuming Jesus. And I pray that the Spirit will guide us in finding concrete ways to fight of the disease of consumption. What Does Church Space Communicate? Here are a couple pictures from Upper Room’s new space. 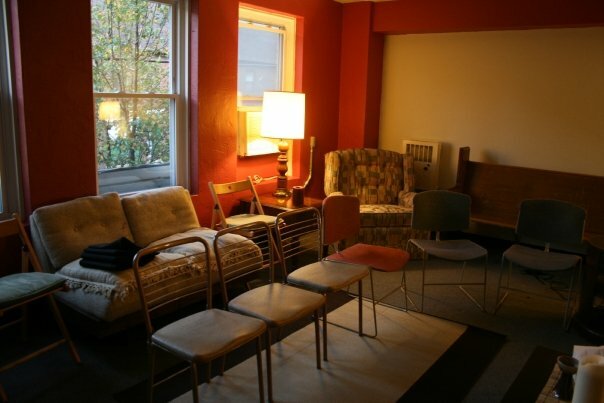 What does the room set-up communicate theologically? What does it say about community and worship? Three things are worth mentioning that aren’t obvious in these pictures: (1) The space is upstairs. When the space became available, we liked the idea of having a worship space in an “upper room”, because we liked the idea of ascending into a place of worship. Sometimes going up and down the stairs feels like you’re entering/leaving a different place. (2) We still use a projector to show the song lyrics on the wall from which the pictures are taken. The projector and computer, however, are hidden in the shelves of the round end-table in the top picture. This keeps the distractions from our own technology (hopefully) to a minimum. (3) We’re next to a movie theater. 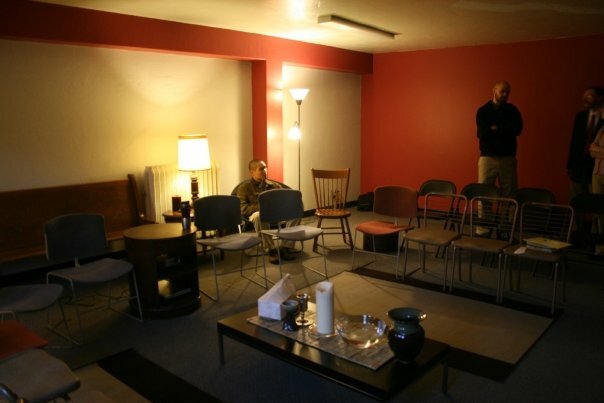 You can sometimes hear sounds from the theater or the nearby bowling alley when in the worship space. It’s not obnoxious or annoying, but it’s enough to remind us that we’re still in the world. I’d like to think that this will keep us from forgetting the importance of mission. So, what does this space communicate? I had to fill up my car’s gas tank today. With all of the errands we’ve run for Upper Room’s new space over the past few weeks, plus several trips to the airport, it seems I’ve been stopping to get gas a lot recently. My dad told me once that one should never let the gas gauge stay below half-a-talk. We were filling up his Toyota at Bruton’s Conoco station in Delta – a frequent occurence since he lived miles outside of town. I had asked why he always filled up when he didn’t really need to: the tank wasn’t on empty yet. I don’t remember the exact answer he gave, but I remember the advice. Now, I see how the wisdom of that advice applies to other areas of life. Having a new church move to a new space ran our tanks down to near empty last week. By the time this past Monday rolled around, I was exhausted, and a couple folks on our steering team had nearly burned themselves out getting the space ready. A lot of us worked more hours than we should have, didn’t take time to rest or nourish ourselves spiritually, and did not pace ourselves wisely. The rhythms of sabbath and daily office have been two ways I’ve learned to fill up my tank before it gets empty. Taking one day per week to avoid all church work and do things that are restorative and life-giving has kept me alive over the past year. The daily office (short times of liturgical prayer at a few fixed times of the day) is a practice I’ve slid in and out of, sometimes keeping it regularly, other times not. (It’s becoming easier, though, since I discovered the online version of Phyllis Tickle’s The Divine Hours.) Not surprisingly, the times when my tank stays full are the times when I maintain these practices. Also not surprisingly, I’ve found both more difficult to keep with all of the busy-ness of Upper Room’s move. There are many ways sabbath and daily times of prayer are beneficial, but what I realized today is that much of the benefit simply comes from the rhythm. Drivers are less likely to look at the gas gauge and see it on empty if they fill up regularly (like my dad tried to teach me). Likewise, we’re less likely to find ourselves spiritually drained when we embrace rhythms of work and rest, action and prayer, community and solitude. The trick is convincing ourselves that it’s necessary to fill up even if we don’t see the warning light. Rhythms help us fill up even if we don’t think we need it.